The unemployment crisis continues to stymie a full economic recovery, with ripple effects from credit card delinquencies and rising food stamp participation indicating new hardships for millions of Americans, according to the latest update of Huffington Post's Real Misery Index. The index for March/April 2010 was 33.1, a slight increase from 33.0 in February, representing another new high in the 26 years going back to 1984 analyzed by HuffPost. Though there have been some encouraging signs, from higher housing prices (which have an inverse relationship to the index) to declining home equity delinquencies, the jobless numbers continue to increase the misery. In addition, nearly 40 million Americans were enrolled for food stamps in February, which has been described by anti-hunger groups as the highest share of the population ever in the assistance program. 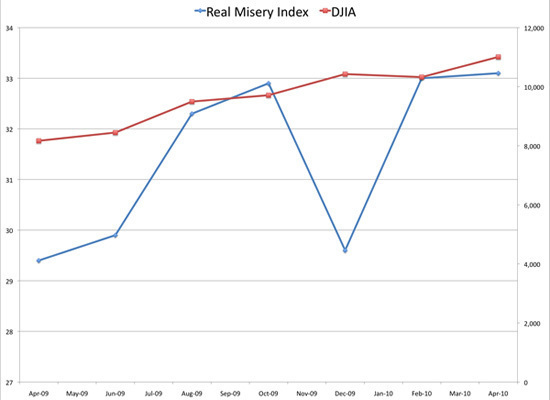 Though the Real Misery Index has increased 16% from March 2009 to April 2010, the stock market has increased 56% during that period, reflecting an alarming discrepancy between the two metrics. Lynn Reaser, the incoming president of the National Association of Business Economists, calls it a two-tier economy, with those who are employed doing better amid rising consumer confidence while the unemployed suffer. Stock prices, meanwhile, are driven by the behavior of investors, who make up a small portion of the population -- not those who are underemployed, says Karen Dynan, the vice president of economic studies at the Brookings Institution. She notes that employment tends to be a lagging indicator, meaning that it is one of the last numbers to turn around during a recovery, and that the stock market has a forward-looking predictive element to it. The hope is that a rising stock market will "stimulate spending and that will eventually create more jobs," she says. To formulate our index, which provides a better snapshot of the economy than the often-criticized misery index (inflation added to unemployment), we used a more accurate unemployment statistic (the U6 formulation), with the inflation rate for three essentials (food and beverages, gas, medical costs), and year-over-year percent changes in credit card delinquencies, housing prices, food stamp participation, and home equity loan deficiencies. We gave equal weight to the broad unemployment numbers and the combination of the other seven metrics (with housing prices having an inverse relationship to the index). Thus, we added the broad unemployment U6 statistic (note: the current U6 was first introduced in 1994 so we used a similar number -- the U7 -- for the years 1985-1993) to the average of the seven other statistics.